Something Fishy Here: In 1946 a suggestion by the League to stock Shawnigan Creek with fry was turned down by the Department of Fisheries on the grounds that the area was now populated and there was a danger of pollution by the spawning and decaying salmon. Tennis Anyone? 1958, the year of the BC Centennial, the MBCL’s project was a tennis court and it was enlarged and resurfaced in 1971. However when Kerry Park Arena was built, this original tennis court was paved over as part of the parking lot and the tennis courts were moved to their present location where they are used by members of the Tennis Club to this very day. Get Your Feet Wet: The League and the Cowichan Valley Regional District provided a public boat ramp at the end of Handy Rd. A Walk By the Creek: Brian Harrison, who served as MBCL President for many years together with Jack Long, one of the directors, laid out the park trail that runs along the creek beside the MBCL Hall. The bank of the creek and the site of the first a ball field were cleared and levelled by league members. The ball field was later moved across the road. Kerry Park Arena Stands On MBCL Land: 1972 Many people in the area, tired of driving to Esquimalt or Chemainus for hockey, voiced the need for an arena. It was decided that the League’s property was the only feasible location and a referendum was held. Brian Harrison, League President negotiated an agreement with the Regional Board and the Arena Commission drilled a well and agreed to pipe water to the hall which previously had pumped water from the creek. The parking lot which the Highways Dept. insisted needed space for at least 275 cars, was paved and a septic field was installed. The land leased to the Arena Commission was 3.85 acres at a nominal fee of $1.00 per year for 99 years and on January 19, 1972 the new arena was opened by Robert Strachan, MLA, and Denis McLean was appointed manager. 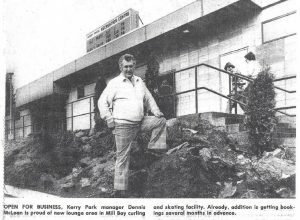 At first it was called Mill Bay Recreation Centre but later renamed Kerry Park Recreation Centre in honour of John Kerry who had donated the land to the Mill Bay Community League. 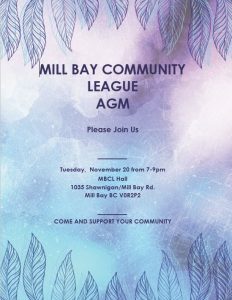 Learn more about the Mill Bay Community League’s efforts on behalf of the community at our Annual General Meeting. Come and support your community. Mill Bay 1907 If you had a toothache it meant a trip to Victoria by train, which took several hours. Teeth were drilled or more commonly extracted both without the benefit of anesthetic.